Me, a lowly teacher, whose work for an evening is presiding over presidents and prime ministers. I am proud and hope that the story is told over and over, and that it serves the memory of the victims, the survivors, and the liberators well. I just can’t believe sometimes this path I have been down, since the day 14 years ago when I took the time to listen to a war veteran, and began to backtrack his story. There are other forces at work here, I think… and there is a cosmic force that reverberates in you when you teach the Holocaust from the heart. His first book, ‘The Things Our Fathers Saw’, is being released to coincide with the 70th anniversary of the end of World War II. His second book, in progress, is on the power of teaching, remembering the Holocaust, the Benjamin photograph and this “Train Near Magdeburg’. He can be reached at marozell at gmail dot com. Holocaust Martyrs’ and Heroes’ Remembrance Day-and the 743rd Tank Battalion. “The anguish of the liberation and return to life”. Note the Benjamin photograph on the banner. From the Yad Vashem website. Fourteen summers ago I sat down to listen to an old gentleman in a rocking chair. A war weary tank commander in 1945, he told me stories of his World War II experiences and then showed me a picture that his major had taken on April 13, 1945. You see, he was there. It would be the first time in decades that this picture had seen the light of day. And because of its discovery, and what we would do with it, thousands of lives were about to change. I hope that whoever was present or sees this photograph will visit our website to learn the powerful story behind this amazing photograph in the context of the 70th anniversary of the liberation. No wonder the survivors of the train refer to April 13th as the day they were reborn. Below is the proper information. Holocaust Martyrs’ and Heroes’ Remembrance Day (Yom Hashoah in Hebrew) is a national day of commemoration in Israel, on which the six million Jews murdered in the Holocaust are memorialized. It is a solemn day, beginning at sunset on the 27th of the month of Nisan and ending the following evening, according to the traditional Jewish custom of marking a day. Places of entertainment are closed and memorial ceremonies are held throughout the country. 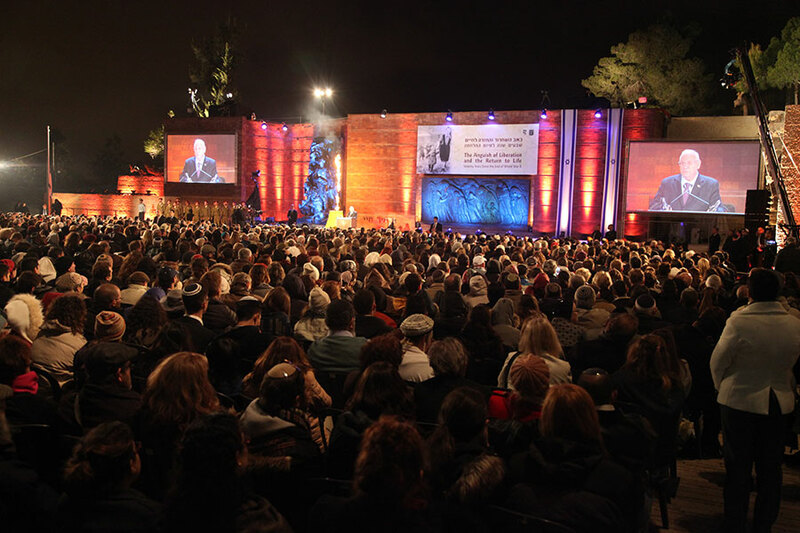 The central ceremonies, in the evening and the following morning, are held at Yad Vashem and are broadcast on the television. Marking the start of the day-in the presence of the President of the State of Israel and the Prime Minister, dignitaries, survivors, children of survivors and their families, gather together with the general public to take part in the memorial ceremony at Yad Vashem in which six torches, representing the six million murdered Jews, are lit. The following morning, the ceremony at Yad Vashem begins with the sounding of a siren for two minutes throughout the entire country. For the duration of the sounding, work is halted, people walking in the streets stop, cars pull off to the side of the road and everybody stands at silent attention in reverence to the victims of the Holocaust. Afterward, the focus of the ceremony at Yad Vashem is the laying of wreaths at the foot of the six torches, by dignitaries and the representatives of survivor groups and institutions. Other sites of remembrance in Israel, such as the Ghetto Fighters’ Kibbutz and Kibbutz Yad Mordechai, also host memorial ceremonies, as do schools, military bases, municipalities and places of work. Throughout the day, both the television and radio broadcast programs about the Holocaust. In recent years, other countries and Jewish communities have adopted Yom Hashoah, the 27th of Nisan, to mark their own day of memorial for the victims of the Holocaust. Holocaust Martyrs’ and Heroes’ Remembrance Day 2015 will be on Thursday, 16 April. The State opening ceremony will be held at Yad Vashem on Wednesday 15 April at 20:00.